Groupama 3 crossed the finish line on her Transatlantic record attempt yesterday – Sunday 2 August – ( read previous story here ) at 14:25 UT. The trimaran, skippered by Franck Cammas, took 3 days 18 hours 12 minutes 56 seconds to cover the 2,880 miles which separate the Ambrose Light (New York) from Lizard Point (Cornwall, UK) at the average speed of 31.92 knots (57 km/hr). However, the transatlantic record held by Groupama 3 since 2007 (4d 03h 57′ 54”) was broken not by its 2009 crew, but by that of Banque Populaire V – who completed the course at 14:17 UT on Sunday also (in 3d 15h 25′ 48”). Groupama 3 was just three miles astern of Banque Populaire – skippered by Pascal Bidegorry – and completed the course twelve minutes after the new Transatlantic record holder. It was an incredible finish with the two rivals within sight of each other. The comeback by Franck during this final section of the course is a positive element when comparing the potential of the two trimarans. Indeed it demonstrates that although Banque Populaire V proved she is extremely quick with eased sheets in the breeze (in over twenty five knots of true wind), covering 907 miles in 24 hrs and reaching speeds of around 40 knots, Groupama 3 – with nine fewer metres of length – confirmed that she is still fast the minute the wind eased to below twenty knots. In fact, Franck Cammas’ trimaran made up ground on its rival over the last twelve hours, snatching back forty miles or so, and making the Lizard with a deficit of just three miles. 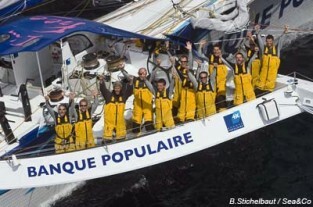 Ultimately though, Banque Populaire V beat Groupama 3 by around 2hr47.